It often seems as if the key cultural accomplishment of current, Hollywood-generated mainstream cinema is its disregard for reality. The laws of physics are offhandedly defied, gravity is treated like an option, parallel universes occlude and eclipse; the likes of Tom Cruise continue to operate with no discernible affiliation with reality. Granted, the real-seeming people of “Puzzle”—Mark Turtletaub’s wry, gentle and quietly radical movie—may seem like they belong to another time. Agnes, played by the wonderful Scottish actress Kelly Macdonald, is devoted to her Catholic church group, her lumpen husband, Louie (David Denman) and their sons, the obnoxious Gabe and the sensitive Ziggy (Austin Abrams and Bubba Weiler, respectively). She doesn’t live a life of quiet desperation; she doesn’t know enough to be desperate. She is sheltered. We all know an Agnes, I suspect. We just haven’t seen her on the screen since Jill Clayburgh was an ingenue. Many will go to “Puzzle” and question whether Agnes is an accurate portrayal of anything or anyone; others will know her as well as they know themselves. Based on the film “Rompecabezas” (“Puzzle” in Spanish), by the Argentine director Natalia Smirnoff, this new incarnation is first and foremost a character study, with the kind of indelible central performance without which, by the end credits, a viewer can’t imagine the movie having been made. Macdonald, best known for such ensemble projects as “Trainspotting,” “Gosford Park,” “No Country for Old Men” and a five-season, Emmy-nominated run on “Boardwalk Empire,” does one of her too-rare turns in a lead role and portions out aspects of Agnes with the same delicate care that South Africa used to place diamonds on the market. We first see her preparing for a party in her modest Bridgeport, Conn., home, during which she tidies, serves, puts the candles on the birthday cake and picks up the pieces of the plate her drunkish husband has knocked to the floor—it looks like an heirloom, and probably is, Agnes being the kind of woman who would be using her grandmother’s vintage Hungarian dinnerware. As it turns out, the birthday girl is Agnes herself. And she gets two gifts that change her life: an iPhone, which she looks at as if it just arrived from Neptune, and 1,000-piece jigsaw puzzle that depicts Montreal, the city she’s always wanted to visit and never has. One lazy afternoon she puts the puzzle together with savantish speed. And her cozy life goes off the rails. The jigsaw puzzle is, of course, a big fat metaphor: Agnes, for all her seeming contentment and quietude, has an inner life that has never come together. Her gift for solving puzzles is not a superpower. It is not a cure for cancer. But it is an indication that, inside, Agnes has untapped intellect. 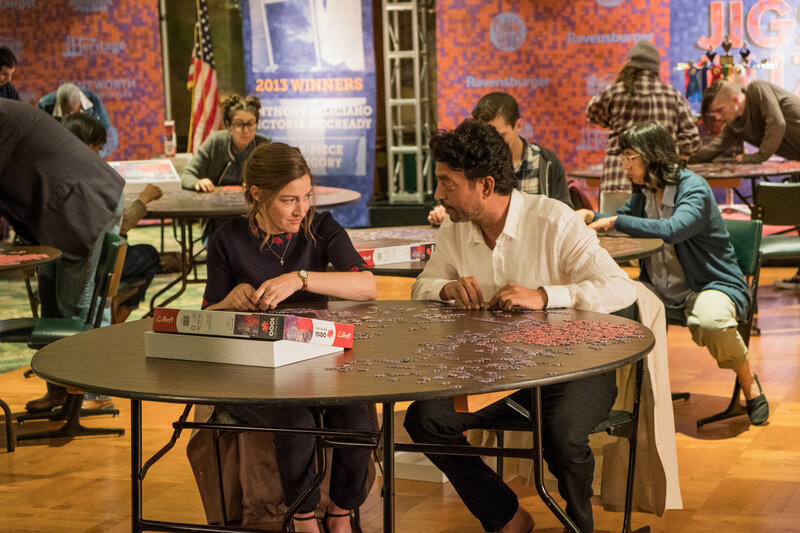 She decides to explore this intellectual potential after she sees a flyer reading “desperately seeking puzzle partner.” Texting for the first time on her new phone, she meets Robert (Irrfan Khan), a wealthy, solitary puzzle freak whose former puzzle partner (his wife) has left him, and left him short a teammate for the national puzzle championships. Once they meet, even Robert is impressed by Agnes’s abilities—and by Agnes. But romance is not the point of “Puzzle.” Freedom is. Freedom from a repression that is partly self-inflicted but also a part of the blue-collar culture Agnes comes out of—and a restrictive, male-dominated perspective on everything from grocery shopping to Ziggy’s choice of culinary school. (“I don’t think it’s a very manly thing to do,” says Louie). In many ways, Louie is more of an anachronism than Agnes, but is that only this critic’s narrow perspective on the life and styles of contemporary Americans? It could very well be. Many will go to “Puzzle” and question whether Agnes is an accurate portrayal of anything or anyone; others will know her as well as they know themselves. What they will all know is that Macdonald gives a terrific performance as a woman coming to friendly terms with her own unsung self. Blue collar culture?What is John Anderson talking about? First of all he does not even know any one from "the blue collar culture". Alright Dear, Thanks for sharing.